The remastered Stranded in Space episode is hot stuff, so we asked Gozer to come on the show and chat about what goes on behind the scenes to create these upgraded adventures! First up is the latest news on the “Duty Officer” system, followed by our review of the new weekly episode “Frozen”. We’ll debate if this mission fell a bit short of expectations, or sets us up for a dramatic thrill! Plus: Chris shares his thoughts on the new Captain’s Yacht vet reward. 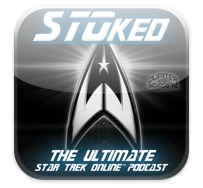 Grab the STOked iPhone/iPod App and download STOked plus bonus content on the go! Boffs can be trained and assigned to positions on your ship. *Duty Officers aren’t trainable, can’t level, can’t go on away missions with you, etc. Bridge Officers are fully featured pets that you can customize, level, and take on away teams. Duty Officers are predefined crew that occupy an org chart on your ship to perform a specific function (add a bonus). They are not customizable, they do not level up, and cannot go on away team missions with you. Where some confusion might be coming from is the idea that we want duty officers to perform assignment missions. An example would be – send these 3 guys to go find stuff. an hour later they return with stuff. You did not accompany them, it all happens outside of view in the background. While the three are gone you cannot use them for anything else. For now, Bridge Officers and Duty Officers do not mix. This may change in the future, but right now they are two completely different types of crew. “More Trek” music on the way? Q: I was hoping you guys would consider adding more music into STO that comes from the movies and series. “constant task that we have to go back and make sure missions work with the new interior.” Now that’s a growing problem! Cutting the Cord (Episode 5 of Cloaked Intentions) City scape. TOS Bridge – Looks Amazing, aka OMG OMG OMG, IE, OMGWTFBBQ want. *Your time starts when you started to actually pay for the game. If you paid for a lifetime sub when they went on sale during Open Beta, then your time started the day you bought the lifetime sub. *If you subscribed during Open Beta on any other subscription plan (monthly, etc. ), then your time started after your 30 day free trial was up, which was 30 days after the 2/2/10 Release day (or March 4, 2010). *Pick it up from the Shuttle Vendor at ESD or Qonos. One the changes we’ve made is in relation to shutting down instance maps that you have just left and fixing some logic on the load balancer.